Visible light communication (VLC) is gaining increasing attention and is considered as a promising technology for future wireless indoor communications. Because movable users expect a seamless connectivity experience when switching among transmitters (i.e., VLC access points) in the VLC system, fast link switching operations must be supported by the networks. 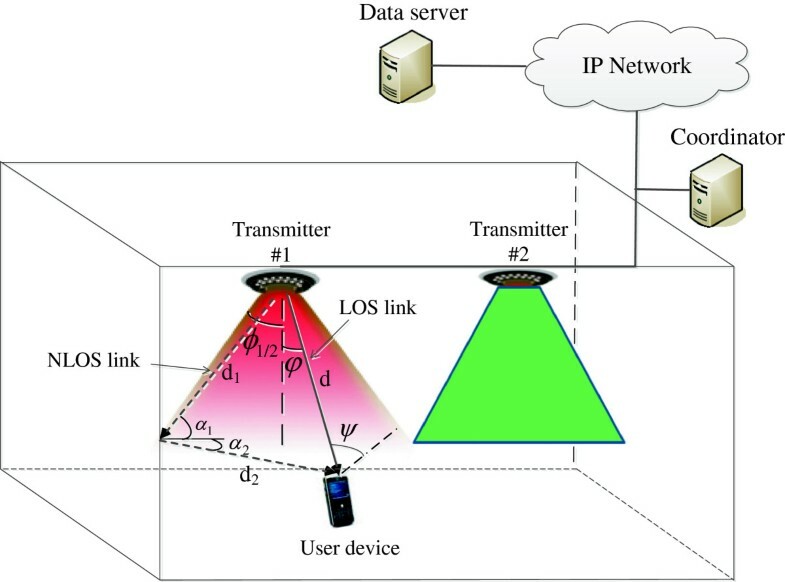 This paper presents a novel hard link switching scheme for VLC networks with the use of pre-scanning and received signal strength (RSS) prediction. Our proposed scheme achieves the advantages of both conventional hard and soft link switching schemes without changing device hardware or the IEEE 802.15.7 medium access control (MAC) protocol. To help compare our proposed scheme with conventional hard and soft link switching schemes, the signal-to-interference-plus-noise ratio (SINR), the outage probability regarding the link switching situation, and the queuing models for link switching schemes are taken into account. 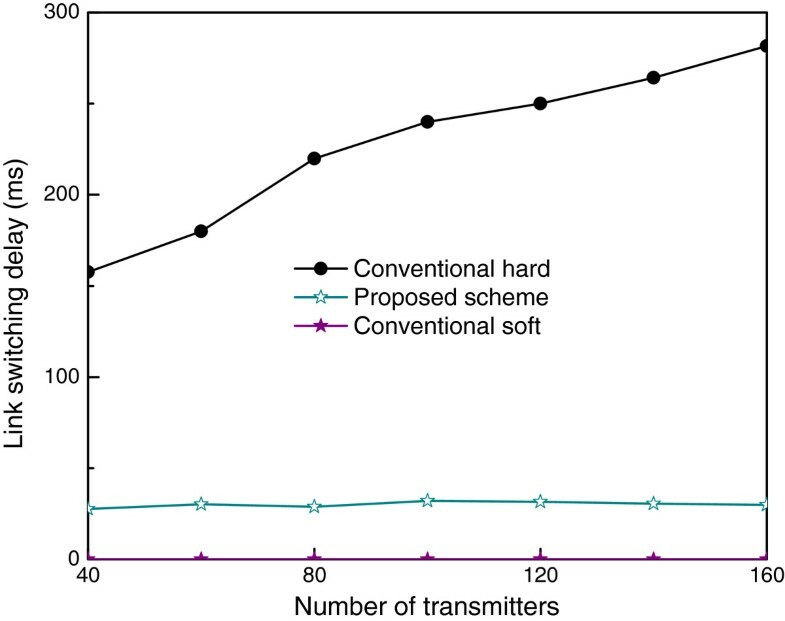 Simulation and numerical results validate that our proposed scheme outperforms conventional hard and soft link switching schemes. Because the requirements for wireless data communication continually increase, the radio frequency spectrum is becoming congested. Hence, quests for alternative communication technologies have been carried out increasingly around the world. In recent years, visible light communication (VLC) has attracted the attention of researchers and has been considered as a promising technology for future wireless communications, especially indoor communications. VLC refers to short-range optical wireless communication using the visible light spectrum from 380 to 780 nm . Compared to radio frequency (RF) technologies, VLC has many advantageous features such as high-speed transmission, visibility, high security, harmlessness to the human body, high tolerance to humidity, ubiquity, and an unlicensed frequency spectrum [2–4]. In 2011, VLC technology was standardized by the IEEE organization in the IEEE 802.15.7 specification . Link switching, commonly known as handover in other wireless communication technologies, is an essential issue that deals with the mobility of end users (the term ‘link switching’ is used in the IEEE 802.15.7 standard instead of ‘handover’). It guarantees seamless connectivity or improves the quality of service (QoS). In first-generation cellular systems, such as the Advanced Mobile Phone System (AMPS) , or second-generation systems such as the Global System for Mobile Communication (GSM)  and Personal Access Communications System (PACS) , a hard handover is deployed. In the hard handover, the old radio link is broken before a new radio link is established, and a user device only connects to one base station at any given time. In third-generation systems, which are mainly based on code-division multiple-access (CDMA) technology, the soft handover concept is introduced . In a soft handover, a user device can communicate with the system using multiple radio links through different base stations simultaneously. 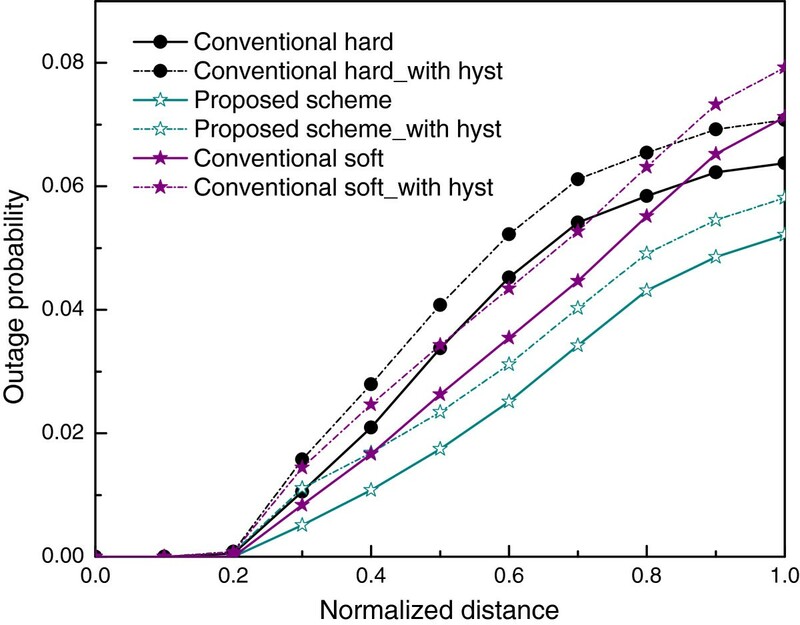 Compared to the conventional hard handover, a soft handover produces a smoother transmission and reduces the so-called ‘ping-pong’ effect [10–12], but it has the disadvantages of implementation complexity and extra resource consumption. Handover is a classic research topic. A larger number of papers have been presented to cope with problems in handover. Some popular problems include the handover delay [13–16], the ping-pong effect, the handover procedure in heterogeneous networks [17–20], and the handover failure rate [21–24]. However, as far as we know, there are not many papers studying link switching in VLC networks. In , a handover mechanism between Wi-Fi and VLC is proposed to dynamically distribute resources to optimize system throughput and to avoid service disconnections. The work in  investigates how handover techniques can be applied in VLC networks in which user connectivity switches from one lighting cell to another. In , based on minimum QoS requirements of traffic, a flexible resource allocation scheme is proposed to support link switching in VLC networks. A novel pre-scanning method, which suits the IEEE 802.15.7 medium access control (MAC) operation, is proposed to eliminate the impact of the scanning process on the link switching delay. A new serving transmitter selection method, using an RSS prediction method, in the link switching decision phase is proposed. This approach can help reduce the unnecessary link switching ratio. An in-depth study of the signal-to-interference-plus-noise ratio (SINR) and outage probability regarding the link switching situation in a VLC environment. The rest of this paper is organized as follows: Section 2 describes the system model of VLC networks including the optical channel model, IEEE 802.15.7 MAC, and link switching fundamentals. Section 3 presents our proposed fast link switching scheme with a theoretical analysis of SINR, the outage probability, and a queuing model. Section 4 evaluates the performance of our proposed schemes in terms of several important metrics and in comparison with conventional hard and soft link switching schemes. Finally, Section 5 concludes our work. In the IEEE 802.15.7 standard, there are three basic devices: a user device, a transmitter, and a single central controller called the coordinator. User devices and transmitters use visible light links to transmit or receive data. Transmitters of a VLC network are managed by a coordinator . The IEEE 802.15.7 architecture is defined in terms of the number of layers and sublayers in order to simplify the standard. A VLC device is composed of a PHY layer, which contains the light transceiver along with its low-level control mechanism, and a MAC sublayer that provides access to the physical channel for all types of transfers. In this section, we represent the optical channel model, the IEEE 802.15.7 MAC protocol, and the link switching fundamentals. where P t is the transmitted power, P r is the received power, and H(0) is the channel DC gain. Transmission model with LOS and NLOS links. where m is the order of the Lambertian emission, A is the photodetector area, d is the distance between the transmitter and user device, φ is the angle of irradiance, ψ is the angle of incidence, T s (ψ) is the signal transmission coefficient of an optical filter, g(ψ) is the gain of an optical concentrator, and ψ c is the receiver field of view (FOV). where ϕ1/2 is the transmitter semi-angle at half power. where α is the refractive index of the optical concentrator. where Λ is the reflectance factor, Awall is the reflective area of a small region, α1 is the angle of irradiance to a reflective point, α2 is the angle of irradiance to the receiver, d1 is the distance between the transmitter and the reflective point, and d2 is the distance between the reflective point and the user device. In this paper, in order to simplify the theoretical analysis as well as the simulation, we assume that the channels of the VLC system are Rician channels in which LOS links are the strong dominant components. The IEEE 802.15.7 MAC protocol , as well as the IEEE 802.15.4 MAC protocol , supports both beacon-enabled mode and non-beacon-enabled mode. In the non-beacon-enabled mode, it is a simple unslotted random access mechanism, with or without carrier sense multiple-access with collision avoidance (CSMA/CA). Because most of the unique features of IEEE 802.15.7 are in the beacon-enabled mode, we will focus on describing it. 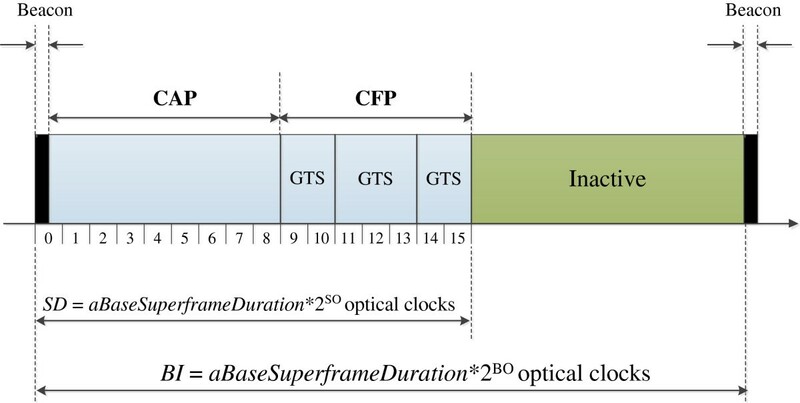 where BO is the value of macBeaconOrder that describes the interval in which the coordinator will transmit its beacon frame and aBaseSuperframeDuration describes the number of optical clocks forming a superframe when the superframe order is equal to 0. If BO = 15, the coordinator will not transmit beacon frames except when it is requested to do so. where SO is the value of macSuperframeOrder that describes the length of the active portion of a superframe. If SO = 15, the superframe will not remain after the beacon. In CAP, devices use a slotted CSMA/CA mechanism to access the channel. The CFP is dedicated to support time-critical data transfers generated by the applications that require specific data bandwidth or low latency. In CFP, data are transmitted in guaranteed time slots (GTS). A GTS can be allocated to an integer number of time slots, and GTSs are allocated on a first-come-first-served (FCFS) basis. Each GTS is reallocated when it is no longer required, or when it has not been used for a specified duration. To support the mobility of user devices, the IEEE 802.15.7 standard presents the usage of cell design and PHY switch . These procedures may be efficiently applicable within a VLC network where user devices do not need to change the network information, such as network ID, and the MAC operation during their movements in order to maintain the data transmission. Besides, in using these procedures, outage may happen because there is no guarantee on the quality of signals (for example, these procedures do not cope with the situation that the RSS of a user device may drop seriously when the user device moves to/move out of the boundary area of a cell). Generally, to support the mobility of user devices within a VLC network as well as among VLC networks, link switching (i.e., handover) is a comprehensive solution. where n is the value of the ScanDuration parameter (0 ≤ n ≤ 14). Conventional hard link switching call flow. After finding the best neighboring transmitter, the user device needs to disconnect from its current serving transmitter (steps 5 to 7). To disconnect the user device from its serving transmitter, the coordinator releases the resources of Transmitter #1 that are used for the user device. The user device starts connecting to the selected neighboring transmitter by sending a link switching request (step 8). The coordinator performs call admission control and radio resource control to check if the call is accepted or not (step 9). 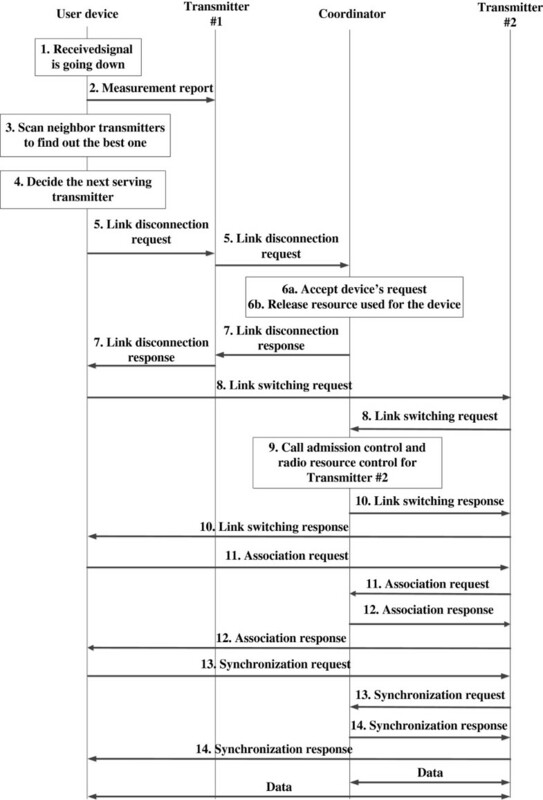 After that, the coordinator responses to the link switching request of the user device (step 10). Then, the user device starts, one by one, the association process and synchronization process with the selected neighboring transmitter, i.e., Transmitter #2 (steps 11 to 14). The user device and the selected neighboring transmitter exchange information such as the network ID, beacon interval, the addresses of the devices, and the channel identification. Finally, the data are sent to the user device through Transmitter #2. During a hard link switching procedure, user devices cannot receive the signal from the serving transmitter, which leads to a data interruption problem and then QoS degradation. Thus, the process duration of a hard link switching scheme (i.e., link switching delay), which mainly originates from the scanning period, is an important problem in terms of guaranteeing a seamless data transmission. This problem can be solved effectively in soft link switching. In soft link switching, a user device can simultaneously communicate with two or more transmitters, including its current serving transmitter. The link between the user device and its current serving transmitter is disconnected only after it has successfully connected to the target transmitter. The main advantage of soft link switching over hard link switching is a better guarantee in data transmission, which originates from the significantly smaller link switching delay. However, to utilize soft link switching, the hardware of user devices must be more complex and expensive compared to that of hard link switching to be able to receive signals from many transmitters simultaneously. Another problem of the soft link switching technique is the use of several channels to only support a single user device, which results in a waste of resources, an increase in the volume of data traffic, and an increase in downlink interference. A link switching may be interrupted in case the user device or the transmitter does not receive the link switching-related signals due to certain factors (such as interference) or the available resources of the selected neighboring transmitter are not enough to be allocated to the user device. To solve these problems, the IEEE 802.15.7 standard presents the fast link recovery and multiple-channel resource assignment procedures . The details of these procedures are beyond the scope of this paper. In this section, we represent our proposed link switching scheme for a VLC system exploiting the operation of the IEEE 802.15.7 MAC protocol. By using our scheme, we can eliminate the scanning period, which has the largest impact on the link switching delay, in a link switching procedure. Additionally, our proposed scheme does not require a change in IEEE 802.15.7 MAC operation and the hardware of user devices as in the case of a soft link switching technique. The theoretical analysis of the proposed scheme is also presented in this Section. As mentioned before, in the IEEE 802.15.7 MAC protocol, during the inactive portion, VLC devices may enter a low-power mode, such as idle or sleep mode. Our proposed scheme utilizes this period for user devices to scan channels, associate, and synchronize with a target transmitter, respectively. The main steps of our proposed scheme are depicted in Figure 4. During its operation in a VLC system, after having received a signal from its current serving transmitter, a user device measures the received signal strength, denoted as Pr,curr. The value of Pr,curr is compared to three thresholds, denoted as Scan_thr, Assoc_thr, and LS_thr (Scan_ thr > Assoc_ thr > LS_thr), to determine the next process precisely. These three thresholds divide the proposed link switching procedure into three periods called pre-scanning, pre-association, and the final link switching decision. Flowchart of the proposed link switching scheme. where k is the number of channels in a VLC system. In the IEEE 802.15.7 standard, the value of k is 7. After the scanning process, the user device saves all the values of the RSSs measured from the signals of neighboring transmitters. Finally, the user device returns to receive data following the IEEE 802.15.7 MAC superframe operation. All the saved values of RSSs from the signals of neighboring transmitters will be used in the pre-association process for determining the best neighboring transmitter. The detailed steps are explained in the next section. During the scanning process, because of several factors, such as interference, noise, channel access failure, transmission speed, and short scanning time on channels, a user device may not receive beacon signals from a (or some) neighboring transmitter(s). Thus, multiple pre-scannings help a user device to eliminate this problem; since then, the scanning result is improved. where Tr is the duration, in the number of superframes, in which the value of Pr,curr is higher than the value of Scan_thr. τ is a predefined integer threshold (τ > 0). P r , curr − P r , prev ≥ Ψ scan . LS _ thr ≤ P r , curr < Assoc _ thr . where a i is an unknown coefficient (0 ≤ i ≤ z, z ∈ Z+). where Pr(j, t n ) is the saved RSS value in the n th process. where A i,i and b i are elements of the augmented coefficient matrix that is generated after several steps of Gauss elimination. The value of P r,pred (j, t n+1 ) of this neighboring transmitter is higher than the value of LS_thr. Among neighboring transmitters that satisfy criteria (a) and (b), the best neighboring transmitter is the one whose predictive RSS value is highest. Finally, the user device returns to receive data following the IEEE 802.15.7 MAC superframe operation. The pre-association procedure may happen several times because the value of P r,curr of a user device may be in the range of [LS_thr; Assoc_thr) in some superframe periods. Thus, to reduce the necessity of performing association and synchronization processes with the same neighboring transmitter, before starting these two processes, if a user device is already associated with the selected neighboring transmitter, it will skip these processes and return to receive data from its current transmitter in the next superframe. The difference between our proposed scheme and a soft link switching scheme is that, after the pre-association procedure, a user device does not transmit and receive data with the selected neighboring transmitter. It only keeps pieces of information related to that neighboring transmitter, such as the address, beacon interval, channel identification, and network identification, which are used to connect to that transmitter in the final phase of our proposed link switching scheme. This work helps avoid the waste of resources caused by using several channels to support just a single user device. The final period of our proposed scheme is started when the value of P r,curr of a user device is smaller than the LS_thr threshold. At this time, first, the user device disassociates with its current serving transmitter and deletes all the information related to it. Because the user device has already used the resources of this transmitter, it cannot disassociate itself as we explained above. In this case, the user device needs to send a disassociation message to its current serving transmitter so that this transmitter can release resources allocated for the user device to avoid the waste of resources. Finally, by using information gained in the pre-association period, the user device switches to the channel of the neighboring transmitter, which was selected in the pre-association period, and follows the superframe operation of this transmitter. Now, the selected neighboring transmitter becomes the new serving transmitter of the user device. The outage probability is an important metric in wireless communication systems. To maintain the QoS, the RSS, or the SINR needs to be maintained above a certain threshold. In this paper, we focus on analyzing the outage probability with respect to three link switching schemes, which are conventional hard link switching, conventional soft link switching, and our proposed link switching. where N t is the total number of neighboring transmitters, H(x, j) is the channel DC gain at location x with respect to transmitter j, and β is the detector responsivity. Let SNR x,i denote the signal-to-noise ratio of the signal received from transmitter i when the user device is at location x. The value of SNR x,i is calculated as . In a VLC network, at a certain time, there is only one user device using the channel of a transmitter. Thus, intra-cell interference does not occur, and we do not take into account intra-cell interference in this paper. where Rout,x(i) is the outage probability at location x with respect to transmitter i.
where N(x, i) is the path loss at location x with respect to transmitter i, d(x,i) is the distance between the user device and transmitter i at location x, dref(x, i) is the reference distance, E(dref (x,i)) is the irradiance at the reference distance dref(x, i), A 0 is the reference photodetector area, Gσ is a zero-mean Gaussian distributed random variable with standard deviation σ, and p is the path loss exponent. where H ¯ x , i is the average value of the channel DC gain when the user device is at location x.
subject to j ≠ k, ∀ j, k ∈ N t .
where M is the total number of prediction samples. where R D h is the call dropping probability of a conventional hard link switching scheme. where R out , x s i and R D s are the outage probability and the call dropping probability of a conventional soft link switching scheme, respectively. where R out , x prop i and R D prop are the outage probability and the call dropping probability of our proposed scheme, respectively. where R h , R B , and R D are the link switching probability of a call, the new call blocking probability, and the link switching call dropping probability, respectively. Markov chain of the conventional hard and proposed link switching schemes. Markov chain of the conventional soft link switching scheme. In this section, we evaluate the performance of our proposed link switching scheme by comparing it to conventional hard and soft link switching schemes. Several performance metrics are used for the comparison, including the link switching delay, unnecessary link switching ratio, new call blocking probability, link switching call dropping probability, and outage probability. We obtain both the simulated and numerical results to evaluate three link switching schemes. Table 1 shows the list of assumed parameters for the performance evaluation. Regarding the simulation, we focused on building and analyzing the VLC MAC operation with a superframe structure, the conventional and proposed link switching procedures, and the channel path loss model that is shown in Equation (26). The transmitters we arranged in a room whose dimensions were fixed during the simulation. The distance between two adjacent transmitters was initially set to 3 m and was decreased when the number of transmitters used in the simulation was increased. In addition, in our simulation, the velocities of the user devices were equal and kept constant. To obtain objective results, the trajectories of the user devices were randomly arranged into various configurations, such as zigzag, arc line, straight line, etc. Figure 7 shows a comparison of the average link switching delay among three schemes used in the simulation. In this experiment, the conventional hard link switching scheme has the worst performance. During the conventional soft link switching procedure, the connections between user devices and their serving transmitters are maintained, so the conventional soft link switching delay is zero regardless of the number of transmitters. By eliminating the scanning period, which is the main cause of the link switching delay, our proposed scheme effectively reduces the data transmission interruption. The link switching delay of our proposed scheme only suffers from a disassociation process between user devices and their current serving transmitters. Simulation results of the link switching delay versus number of transmitters. Figures 8 and 9 show the numerical results of the link switching call dropping probability and new call blocking probability under various new call arrival rates. Our proposed scheme and the conventional hard link switching scheme achieve the same performance, whereas the conventional soft link switching scheme achieves the worst results among the three schemes. This result can be explained by the fact that because the conventional soft link switching scheme allocates more resources to a call (multiple transmitters serve a link switching call simultaneously), the system runs out of free resources faster than in the case of the two other schemes. Additionally, when the new call arrival rate increases, the link switching call dropping probability and the new call blocking probability also increases. Numerical results of the link switching call dropping probability under various new call arrival rates. 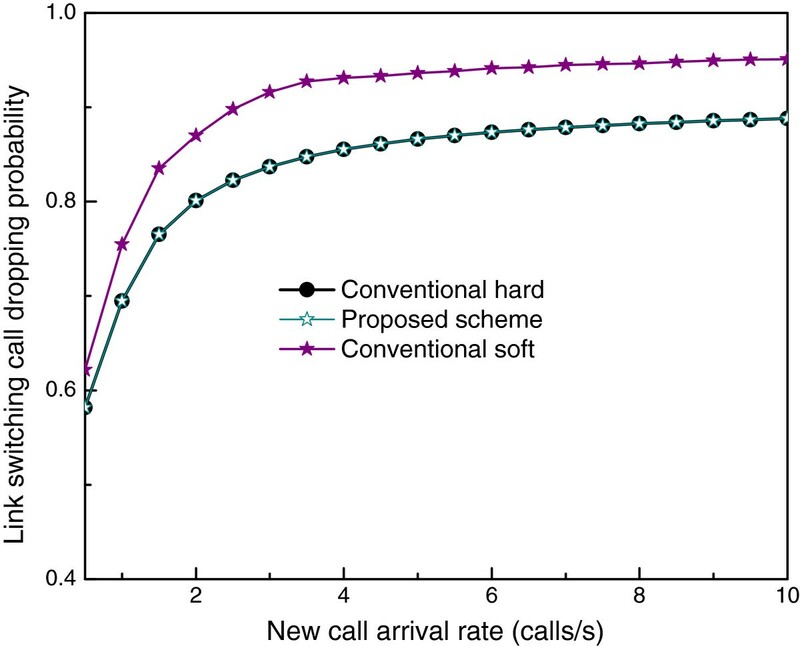 Numerical results of the new call blocking probability under various new call arrival rates. In the hard link switching case, the link switching delay is increased along with the increase in the number of transmitters in the system. The number of transmitters also affects the unnecessary link switching ratio, as shown in Figure 10. The unnecessary link switching ratio is a parameter used to assess the performance of a link switching scheme in terms of coping with the ping-pong effect. The conventional hard and soft link switching schemes only choose the next serving transmitters for user devices based on the RSS values of neighboring transmitters at the selection time, so their unnecessary link switching ratios are equal. The simulation results shown in Figure 10 help in validating this assessment. 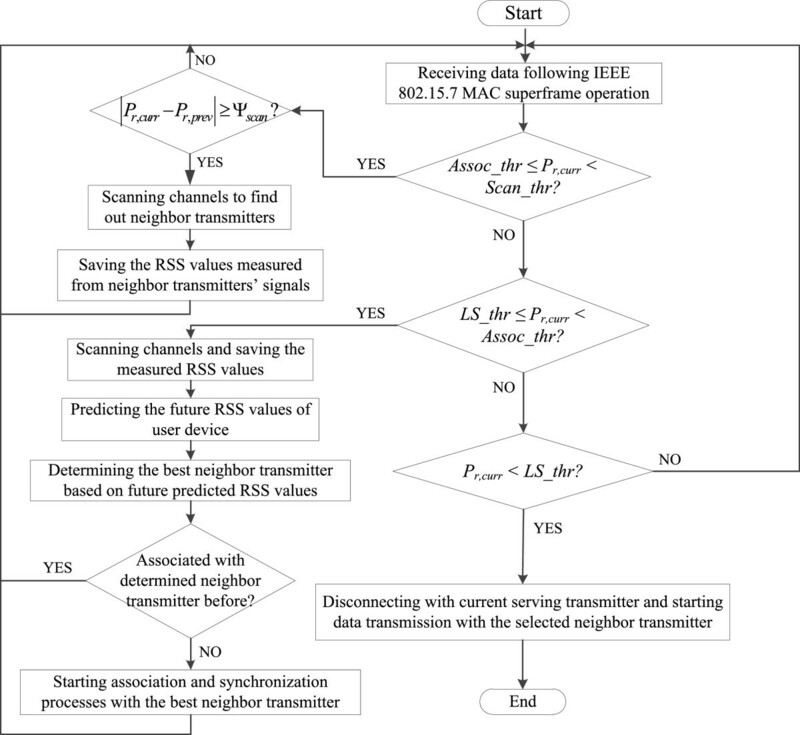 Utilizing the knowledge of previous RSS values of neighboring transmitters combined with the RSS prediction scheme, our proposed scheme helps in choosing the next serving transmitters for user devices more precisely, so the unnecessary link switching ratio is decreased as well. Comparison of the unnecessary link switching ratio using simulation results. where Hys_thr is a predefined value of the hysteresis margin. 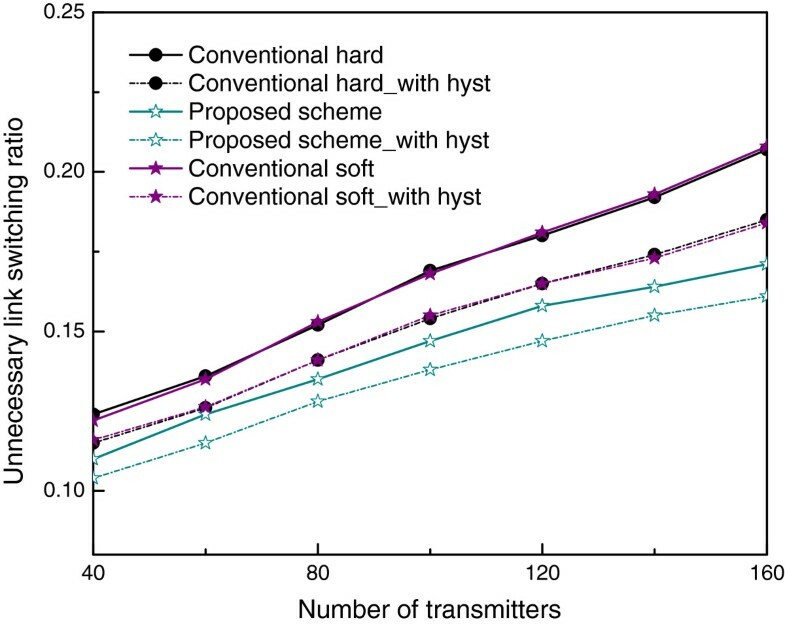 The hysteresis margin method can help reduce the unnecessary link switching ratio that is validated by the simulation results shown in Figure 10 (the value of Hys_thr is set to 4 dB in our experiments). However, the use of a hysteresis margin results in an increase in the outage probability, which is made evident by the numerical results shown in Figures 11 and 12. In Figure 11, the outage probabilities of the three schemes according to the normalized distance are represented. In this experiment, the new call arrival rate is set to 1 call/s. In the region near the transmitters, where the normalized distance is less than or equal to 0.2, the outage probabilities of three schemes are almost equal to zero. The outage probability of our proposed scheme is lower than those of the two other schemes, even in the boundary area. In the cases of both using as well as not using the hysteresis margin method, the conventional hard link switching scheme achieves the highest outage probability when the normalized distance is less than or equal to 0.8. Numerical results of the outage probability according to normalized distance. Numerical results of the outage probability under various new call arrival rates. The new call arrival rate affects the link switching call dropping probability, so the outage probability is affected as well. Figure 12 shows the impact of the new call arrival rate on the outage probability when the normalized distance is equal to 0.5. The new call arrival rate affects the conventional soft link switching scheme more seriously than those two schemes. 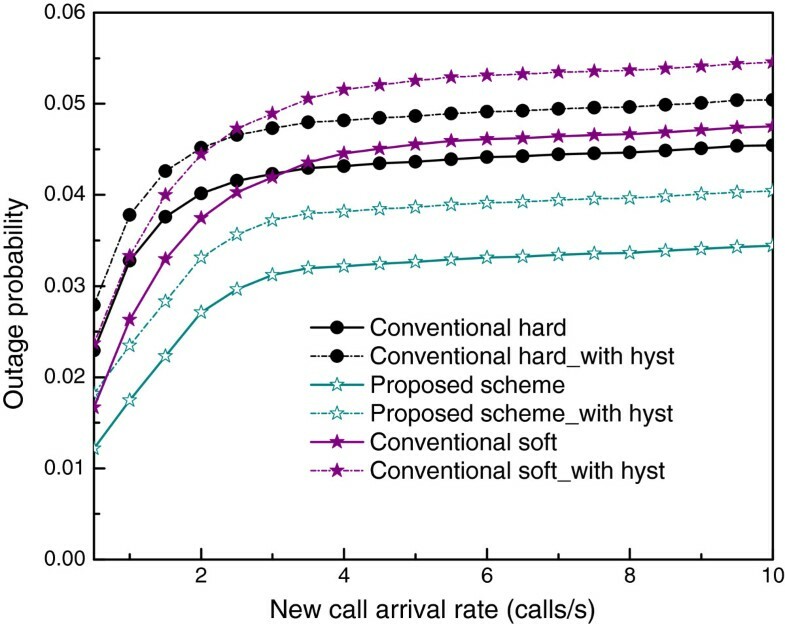 In the case when the hysteresis margin method is not used, when the new call arrival rate is less than or equal to 3 calls/s, the conventional hard link switching achieves the highest outage probability. 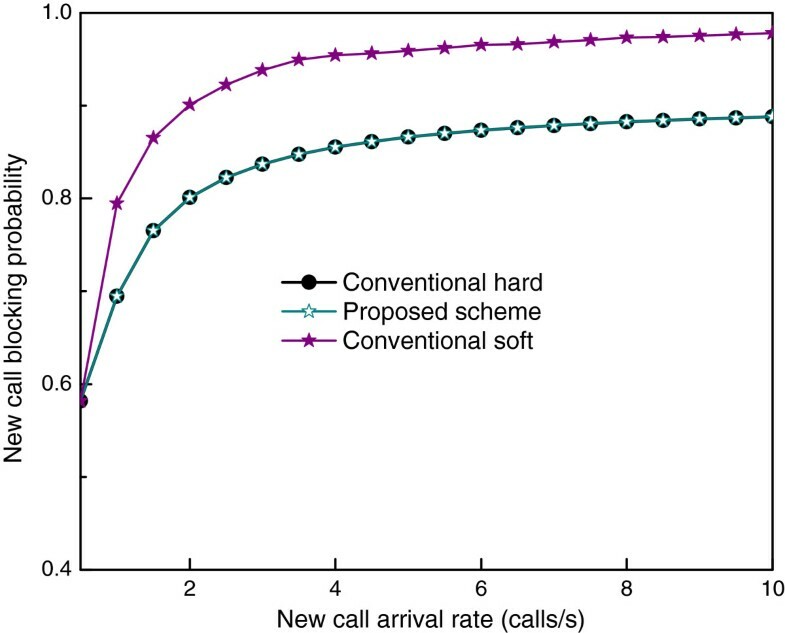 However, when the new call arrival rate is higher than 3 calls/s, the outage probability of the conventional soft link switching scheme becomes the highest. This paper has presented a novel hard link switching scheme, which overcomes the drawbacks of conventional hard and soft link switching schemes, for VLC networks. The proposed scheme uses pre-scanning and predictive RSS methods to reduce the link switching delay and the unnecessary link switching ratio. In addition, the SINR and the outage probability are analyzed with respect to the link switching situation in a VLC environment. The proposed scheme achieves a lower outage probability compared to the conventional hard and soft link switching schemes. To utilize our proposed scheme, there is no need to change the hardware of the user devices and the IEEE 802.15.7 MAC operation. Therefore, the proposed scheme is expected to be a possible approach for a practical link switching implementation. In the future, we will work on handling the increase in the overhead caused by multiple pre-scannings in our proposed scheme. This research was funded by the MSIP (Ministry of Sceience, ICT & Future Planning), Korea in the ICT R&D Program 2013.